When it was first developed, the railway system revolutionised industry, commerce and the way people travelled, both for business and pleasure. The railway is an integral, hugely significant and fascinating part of our collective history. It is not surprising, then, that an entire industry has developed around the manufacturing and collecting of model trains and railroads. Each of these carefully constructed pieces holds within it a heritage and a story that has helped shape the world as it is today. Some of these items are not only historically significant, but have a high monetary value as well. For a collector who has spent a lot of time, money and effort building and developing a collection and setting the layout, losing it all can be devastating both personally and financially. Home contents insurance doesn’t always provide sufficient cover and the outcome can be extremely upsetting. 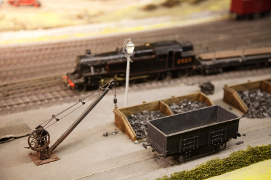 By joining this group, you club together with other model railway collectors for a great deal on insurance, to make sure your collection never runs out of steam!